Damn! That’s a quite a price. I wonder if this will be new artwork or recycled. And if it’ll get a shelf case. Holy Sh!t! 4K complete set...DAMN! Me wantz! but for that price will probably have to stick with what I have. Its cheaper than the current 4K set. Hopefully it's like this French 4K set, then I'm definitely getting it. This will definitely be the same design as the French and German ones. But that price is much higher than the German (never mind the French, it won’t have 4K), at least for me to import. I'll stick with my german amazon order...about $70 cheaper. That price is really Keeping my Amazon DE order. Was it ever confirmed that the titles on the German steelbooks are in English? Accrding to the stock photo on Amazon.de, it is. 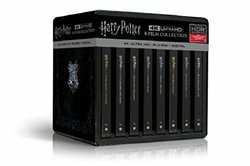 These steels haven’t been released in Germany before and considering these are coming to other countries now it should be safe to assume they will be with English titles. Not so sure about the French though. Artwork is up at BB, updated OP. Curious when they plan to go live with the preordering as it's due out in just over a month from now. ??? Might turn out to be in store only considering the size of the set - might not be worth shipping to people directly. Ah, yeah makes sense, thanks. The French set appears to be the original French text Steelbooks with Blu-ray and bonus discs for each movie, no UHD. It's also $80 and shown in a bunch of French retailers to not be UHD. The German set is definitely UHD and also currently $75 USD less ($150 shipped) but the discs will be German discs (still region free with English I assume) and it will have to be shipped, meaning much more chance for the box to be damaged. Inspecting this in-store at BestBuy is probably the best bet, but if you don't care about the box the German set is a better deal.